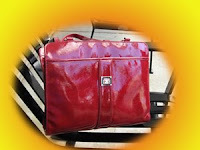 Here's my "radiation purse" I bought recently. I've gotten a ton of comments about it...I'm not exactly the "bling" type, but this really appealed to me. My leg was looking about this red last weekend when Mom, Aunt Evie, Aunt Jan and my cousin Cindy were here. and talking. Last week the fatigue started hitting me a little bit. My sleep cycle has been so messed up these past few weeks....I had been taking long naps after treatments (2 hours sometimes) but I stopped doing that and started trying to get to bed by 10:30 or 11:00, which for me is unheard of. I've been sleeping till 9 a.m. and still kind of draggy in the afternoons, but I'm finally feeling a little more on an even keel than I have been up till now with the emotional rollercoaster slowing down now as we get (hopefully) to the end of this wild ride. I put the Manuka honey on my leg Friday through Sunday and it looks better this weekend than it did last weekend. 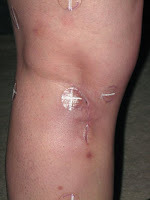 However, it has also started itching very slightly, (which is a new symptom) and the top of my incision and a spot where there was a suture sticking out of my leg for a long time started oozing a little bit for the first time. The honey causes a mild tingling sensation, (the article I read about it said it has natural hydrogen peroxide in it) so it seems to be doing something, but it LOOKS amazingly better overall than it did before, and it's definitely healing even though Mike said it probably WON'T while I'm having treatments. I'm continuing to use the XClair cream which is working really well for me too; it helps with the mild itching (so does the honey) and so far I have no dryness/flakiness or blistering. I'm actually amazed at just how "normal" my skin feels except for the area around the incision which is still kind of stiff. lumpy and puffy. If I can just hold out this week without blistering I'll be SOOOOOOO happy. Beverly (one of the therapists) called at 7:45 Monday morning to say that the machine was down, so they cancelled their morning appointments. I was kind of glad because I was exhausted that morning. Sybil woke me up at 3, then barfed up a hairball at 6, then I got a wrong number phone call at 7 a.m., then Beverly's call at 7:45. 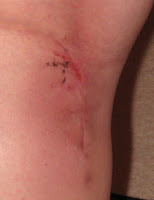 Best of all, that meant my incision would have another day to heal. The downside is that now I won't end on my birthday and will have to finish up on Monday, October 20. But I REALLY like the idea that I'll only get nuked 4 times this week, and I get the weekend to heal again. They called later and said the machine was back up, but I was on a roll getting kids' choir stuff organized for our first rehearsal this week, so they said it was OK to just wait till this morning instead. Children's choir starts Thursday; I'm really fired up about that. So far I have received sixteen registration forms and I expect more kids to show up without having signed up. I have a lot of 4th and 5th graders this year and a good number of new children coming in. I've missed the kids choir at St. James terribly these last couple of years, and was excited to teach the kids at St. Monica's some handchimes last year. We'll get to do a lot more since I'll see them every week now instead of just occasionally. 1. Mild fatigue that is somewhat different from before. I'm trying to adjust my sleep cycle to get more done now that I'm less frazzled about this whole ordeal and have gotten used to the routine. 2. Mild Itching on the top of my incision where it broke open and never fully healed before I started radiation. 3. Slightly LESS redness than last weekend which I attribute to the manuka honey. 5. Continued swelling in my leg if I sit or stand too long in one spot. I have to keep it raised or it gets hard as a rock. That has been the case since very early on, starting during my second week. 1. DEALING WITH INSURANCE/BILLING QUESTIONS! I spent several hours on the phone yesterday trying to figure out insurance related stuff: my coverage, limits, exclusions, what bills I have to pay and which ones will be adjusted later. I've got two college degrees and this stuff is EXTREMELY confusing. The statements of benefits don't tell you enough detail to even know what the charges are FOR when you're having massive stuff done to you every day. I've gotten conflicting answers from the insurance company and the Archdiocese about some questions that will affect my out of pocket expense. I'm being billed for $20 a day in copays for radiation, which comes to a whopping additional $660 out of pocket over and above my $1500 maximum out of pocket expense which I've already met this year as of my surgery date. It's staggering, and the bills are only just now starting to come in. 2. Driving downtown every day is also draining, and for the past two weeks many gas stations haven't had any gas at all. Luckily I filled up over the weekend but it's scary to think that if you don't get while the gettin's good, you could be stranded on the highway somewhere. 3. Car maintenance and repairs. Had to get a new catalytic converter recently in order to pass emissions, but I am so relieved I DID this year; I had to get a waiver last year. Since I passed, now I needed to get new tires since mine are bald and I've still got three weeks of going downtown everyday and the last thing I need is a blowout. So I spent THREE HOURS waiting for my new tires to get put on the car today. At least I got my songlists sketched out through All Souls Day while I waited, but I think they tacked on an extra hour because I refused an additional $200 repair they recommended. 4. Never knowing how long you'll be there. One day my valet parking receipt said 7 minutes!!! That's ~90 minutes of driving MINIMUM for 7 minutes. Other days, it can be 1 1/2 hours. You just never know, and that's stressful and draining. I've just finished my second week of 6-1/2 weeks of radiation therapy. Woo-hoo!! Tomorrow I'll be 1/3 finished. Here's proof that I was checked in for my treatment today. (I'm the second name from the top.) 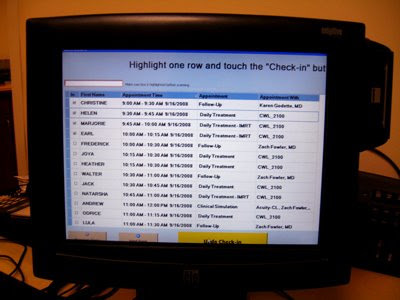 You come in the front door, click the box next to your name on the screen to check in, and then go into the waiting room until you're called. One of the therapists (Mike, Niki, Beverly or Derrick) puts a sticker on your valet parking ticket every day so it's free. Every day except Tuesday you just get your treatment and go. 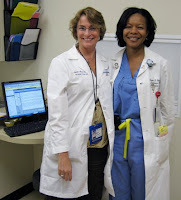 On Tuesdays, we're here for much longer since every one sees Dr. Godette, our Radiation Oncologist today. She said everything looks good so far, and the very minor side effects I'm experiencing (swelling at night, slight redness) are to be expected at this point. The only fatigue I have so far is really just long term from the emotional rollercoaster I've been on with this since June, only just finding out I actually HAD cancer ~August 12, got my final diagnosis of "undifferentiated sarcoma" on August 20, and of course the physical healing from surgery August 4 and the fall schedule ramping up already at church. Here's Derrick and Niki just before my treatment today. On the way home I saw the "Jesus" van, which can be seen around Gwinnett county every now and then. 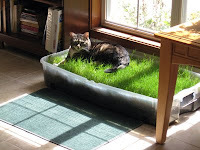 And finally, here's Sybil relaxing in her grass patch. I recently got her a couple of new pieces of Bermuda sod, which she clearly prefers to the Zoysia I got last time; she hated it and never went near it. Now it's time for ME to rest for a while so my leg doesn't swell up too early in the day. I was up way too late catching up with my blog, and I'll try to stay current from here on out. Signing off for now. Just wanted to say thanks again to everyone for your continued prayers, especially all my wonderful friends at St. James in Mukwonago (and elsewhere in WI) and in Baltimore, MD as well as here at St. Monica in Duluth, GA, and to my friends and family in Louisiana, Texas and Mississippi and various other places around the world. 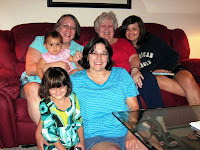 Mom, Aunt Evie and Aunt Jan are coming to visit over the weekend, and I'm looking forward to that! 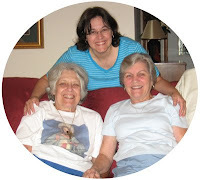 (And hi to my Emory waiting room friends, Heather and Joya!) Joya is in her final countdown-she finishes her radiation on Monday. WOO-HOO! Every day, Monday through Friday for 6 1/2 weeks (starting the Wednesday following Labor Day ending on my birthday, October 17(!)) I need to get external beam radiation therapy. 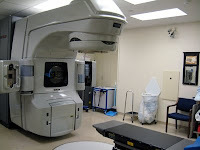 The machine is called a linear accelerator. 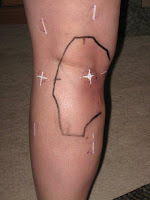 Here are some pictures that help explain the + and - stickers on my leg. 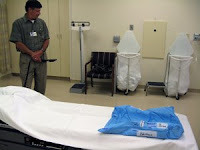 They are basically registration marks to line up the radiation beams, and they match the foam leg cradle that was made based on the CT scans they took of my leg during the first part of my simulation before Labor Day. I drive downtown for 45 minutes to 1-1/2 hours each way every day for a very expensive treatment that lasts maybe 40 seconds. (Although some days the wait can be fairly long.) On Tuesdays my appointments are much longer because Dr. Godette sees all the patients personally to check on their progress, monitor any side effects and answer any questions we might have. I asked Mike if they get many repeat "customers." He said no, which was reassuring, but that people DO come back to say "hi" just because they like them. Today I was at the hospital for several hours because I had to fill out forms requesting that errors I found in my medical records be corrected. I had to fill out ANOTHER form requesting to set up an appointment to see ALL of my records, but I really want my baseline records to be as accurate as possible, and the number of transcription errors and typos were somewhat disturbing. They don't make it easy for you to FIX these either, but I think it's worth it to just take care of all this NOW since I'm downtown every day anyway. 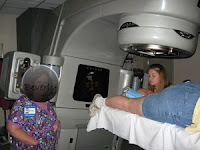 Here are some pictures I took last week of the radiation therapists I see every day. Mike is by himself in the photo at the top. At left, that's Josh (a medical student I've only seen once or twice,) Niki, and Beverly (who used to be a school teacher) . 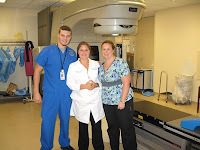 Derrick, a new radiation therapist, started on Thursday. He just moved up here from Houston (good timing since Ike just hit!) I asked if he was a med student and he said he'd been doing this for 13 years....(sigh....I'm getting old because almost EVERYONE looks really YOUNG to me.) He's from Biloxi originally, but moved to N.O. and worked at Charity Hospital before Katrina hit. Then he moved to Houston, and now here. I'll get a picture of him soon. 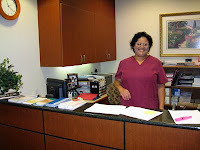 The other photos are Brenda (one of the nurses) at the desk, and in the treatment room, Niki and Beverly. I promised Beverly I'd block out her face since she REALLLLLY didn't want her picture taken right then, and Mike took it anyway. Photos below are Hailay, my valet parking attendant, and the Agnes Glenn Building where I go every day Monday through Friday to have radiation. 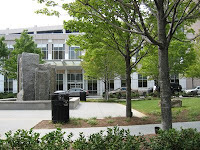 It's adjacent to Emory Crawford Long Hospital where I had my surgery. A lot has happened since I wrote last, but it's too late tonight to catch up. So here's a picture I took in the waiting room on September 9. 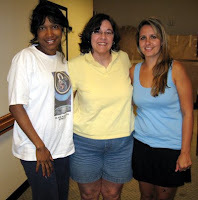 Here's Joya, me and Heather, waiting to get our radiation treatments. How on earth did all of us wind up with cancer?! Joya has breast cancer, and she had to go through chemo as well, but is doing great. 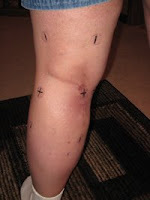 Heather has a type of sarcoma too (it was a low-grade sarcoma that was on the front of her leg for at least six years!) Neither of us needs chemo, but Heather will need another surgery after radiation since her doctor did NOT expect her tumor to be malignant, and they need to go back in and scrape out her leg to make sure everything's gone. Again, I'm just so amazingly lucky that Dr. Oskouei (and apparently Dr. Maxa, since he referred me to Emory) suspected sarcoma from the beginning. Although the drive downtown every day is tedious, it has been really interesting and encouraging getting to know other people who are going through this at the same time. Without exception, every other patient I've spoken with is extremely optimistic about their prognosis. We ALL feel very blessed. So far my only side effects are some swelling at (usually at night) which started on Saturday night, and what looks like a faint sunburn at times on part of my thigh. The skin around my incision is darkening, and I had them take off the "plus sign" sticker that's nearest my incision in the crease of my knee because it was bothering me and I was afraid it would eventually start to hurt. They painted my skin with silver nitrate which will last about 2 weeks. It has felt significantly BETTER today, and I can put the XClair cream on it, so I'm a happy camper today. SIX treatments down, 27 to go. 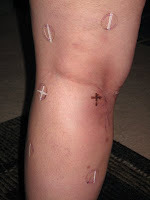 This picture shows what my marks looked like on Sept. 9, 2008, BEFORE the silver nitrate change. Tomorrow is 9/11. Hard to believe 7 years have passed since the terrorist attacks. The choir is singing at a special Mass, and then we'll practice for the weekend after that. The white marks are my "permanent" marks now. The area within the black outline is the area being irradiated. 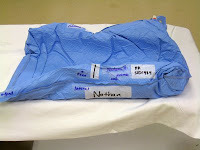 I can remove that; I asked them to mark it for me so I could see the actual area that I need to put the medicine on, and so I could show everyone via this blog what was happening. The first visit took longer than any others will, because after my first treatment, Ann (the nurse practictioner) and Dr. Godette both talked to me for a while. Bubba, Aida and the girls went down to Destin for a little vacation at the beach instead of heading back to New Orleans just to sit in the traffic again since people are only being allowed to come back just now. They will go back on Saturday. Mom and Dad evacuated to Aunt Jan's in Ocean Springs, MS, and they'll go back tomorrow or Friday. Here's what my marks looked like on September 2, 2008, the day after Labor Day, when I had the final part of my simulation. They take a bunch of X-rays and position you on the table to make sure everything lines up. 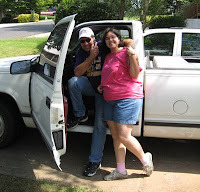 Bubba and Aida, Allie and Amie, Vicki, the two birds and all their valuables arrived yesterday afternoon after they spending the night in Birmingham, Alabama since it took them 17 hours to get just that far from New Orleans in the evacuation traffic for Hurricane Gustav. Bill and I both feverishly researched hotels on the internet for at LEAST three hours straight, and the only one we could find at all that still had room was in Birmingham. There was nothing at all in Mississippi along Hwy 59/20, the route they decided to take, and it took them FOREVER just to get past Meridian. Had they attempted to get all the way to Atlanta, they wouldn't have arrived until 5 a.m. and would have been on the road for ~21 hours straight. They said the hotel was PACKED with people and all their pets and valuables. Bill had called the hotel about an hour after we made the reservation and pretended he was Bubba calling, wondering if they might be turned away since pets weren't allowed and nothing else was available. The hotel was already sold out by then, but they verified that they WERE holding a reservation for him, and yes, Vicki (their Dalmatian) would be OK. I cried on Sunday night, overwhelmed that I would have a house full of people and animals in the same week radiation was starting and our first choir practice of the season was happening, when I had absolutely no time or energy to prepare myself for all of this. It was great to see the family but since my surgery, I had only had "close to normal" energy levels for maybe two days before they arrived, and I've been too exhausted to think straight, much less get any work done to prepare for the fall. But all was fine. I kept Sybil locked up in the bedroom and master bath the entire time they were here so Vicki could have run of the house, and the kids are really well behaved. The timing was just really stressful, though.